China's Homeless Generation is a study of nearly two million Chinese who were displaced from home in Mainland China to the island of Taiwan. A result of the Chinese civil war between the Chinese Nationalist Party (KMT) and the Chinese Communist Party (CCP), this massive migration began around 1948 and continued for more than a decade. The displacement officially lasted until November 1987, when they were legally allowed to return for the first time in nearly forty years. Collectively, referred to as the ‘Homeless Generation’, this unique study makes extensive use of these survivors’ own voices to formulate a truly fascinating story of a generation of Chinese who found themselves outsiders not just in Taiwan, but in the places they called home. Joshua Fan provides a detailed picture of the exodus, the struggle to find a new home in Taiwan, both physically and psychologically, and ultimately the experiences and effects of returning to the mainland decades later. This book will be of interest to students and scholars of Chinese history, the Chinese civil war, Chinese Diasporas, and China Studies in general. 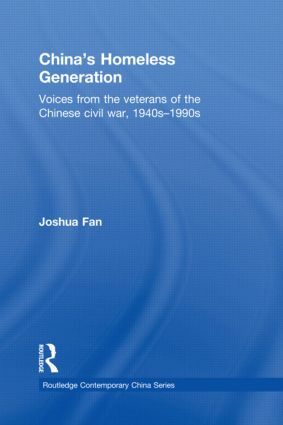 Joshua Fan is Assistant Professor in the Department of History at the University of Texas at El Paso, USA.